This mean looking brush will have dirt and mildew quaking with fear thanks to its destructive reputation. Where other options fail, this one will succeed because it offers more surface area, better angles and stronger bristles. With very little effort or pressure applied, it will cut through and remove tough grime that others leave behind. It has an angled shape that's designed to clean tile and grout lines all at once, so it will save you time and energy while providing better results. Attach to a pole for a longer reach, or use in your hand like a regular brush. Either option will offer quick results, comfortable usage, and remarkable cleaning power. An added row of Nylo-Grit bristles at the center ensure you can scrub free any type of dirt, and polish the surface to a sparkling finish. Stop wasting money on flimsy versions that force you to do all the work, and don't waste another minute using so called commercial versions that only flatten or fail with more than one use. This powerful alternative will work better than what you are using now, and it will hold up through many uses without wearing out. Top Quality. Better materials, more bristles, and an improved design combine with other key factors to make this tool outperform others. It's guaranteed to work well and last a long time. More Bristles. 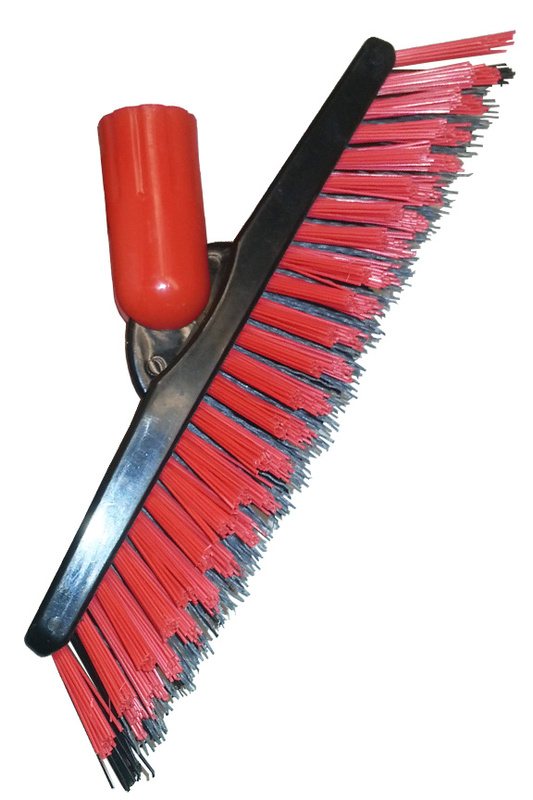 Full groupings of thick bristles provide an incredible amount of surface area to make cleaning easy. Compare to other tools, and you will find up to 50% more on this one. Specialized Scrubbers. 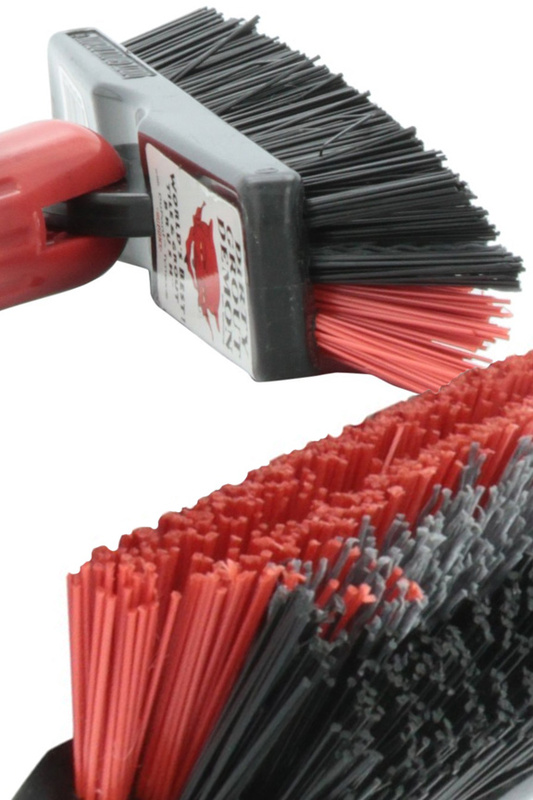 Added TYNEX Nylo-Grit bristles are thinner and more flexible, but they have added silicon carbide scrubbers. Deep clean skinny cracks, and the top of the tile with the same motion. The tips will not round or wear down, so cleaning power will not reduce over time. Added Versatility. Other brushes have trouble with the thin lines commonly found in restrooms. This one works on any size, and will get deep down, no matter how skinny the area. Better Shape. The overall shape is sort of triangular. This allows you to dip down and scrub grout, but the wide brush and angled bristles also clean the top at the same time. Unique End. Instead of a straight rectangle with flat sides, this brush is angled at the ends so it works all the way to the edges without extra effort. Hard Worker. Flimsy brushes and soft bristles found on other products force you to sweat and strain, or resort to toxic chemicals. This powerful alternative does most of the hard work for you, and allows you to get better results. The gray bristles at the center of this brush are made from a specialized nylon filament that has been extruded with silicon carbide. This gives it added strength, stiffness, fatigue resistance, durability and chemical resistance. It also gives it a sharp cutting edge on all sides, and at random positions. The flexible material will bend and conform to any surface in order to get down deep, and scrub at all angles. Although abrasive, and outstanding for it's cleaning ability, it will not gouge the material. Instead it will sort of polish and clean at the same time. Looking for something that costs a bit less? Check out the Shark Tile And Grout Brush. It has a similar design, but it doesn't have the specialized row of center bristles. It still works remarkably well, but it may be a better choice for those that will use one less often, or anyone only cleaning a small area. Want a brush that's smaller? Check out our mini grout brush. It's great for tight spaces or quick cleanings, but it is smaller, and it won't attach to a pole, so it's for hand held use only. How about a small brush with an advanced, curving head? Our deluxe hand held grout brush is also small, but it's design offers advantages for certain users, surfaces or types of grime, so you may prefer it over the regular version. Trying to reach high up? Have a large section of tiled floor to scrub? This tool can be attached to a long pole, or used without one for added versatility. It's totally comfortable when gripped with a single hand, but you can also twist it onto a standard pole for easy operation, or an improved reach. 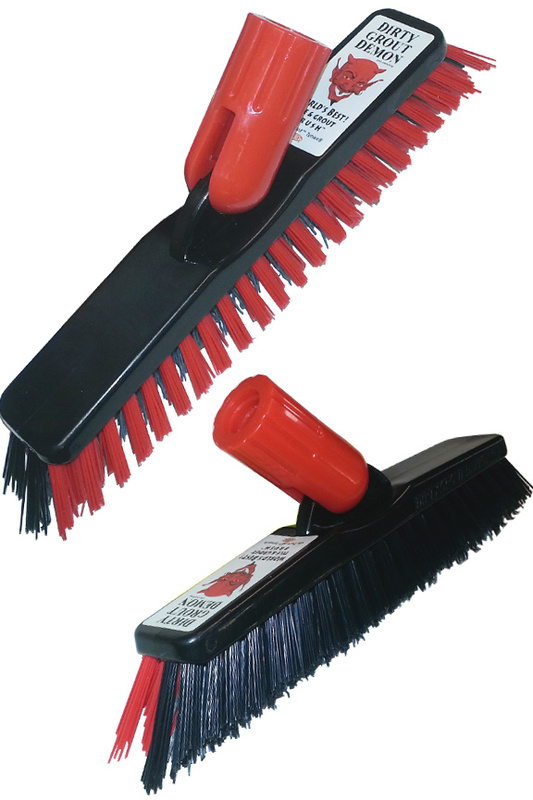 Order as a set from us, or get the brush alone to use a mop or broom handle you already have. The addition of a steel extension pole will eliminate bending and allow you to work while standing, but it also allows you to get tough spots without climbing or straining. A simple, light action will produce amazing results, and unlike other tools, you will not have to sweat or struggle to get things clean. A little back and forth motion is all that's required, but follow the tips and instructions below for best results. To clean, hold in your hand, or combine with a pole. If adding a pole, find the red, swivel attachment at the top, and twist on until tight. 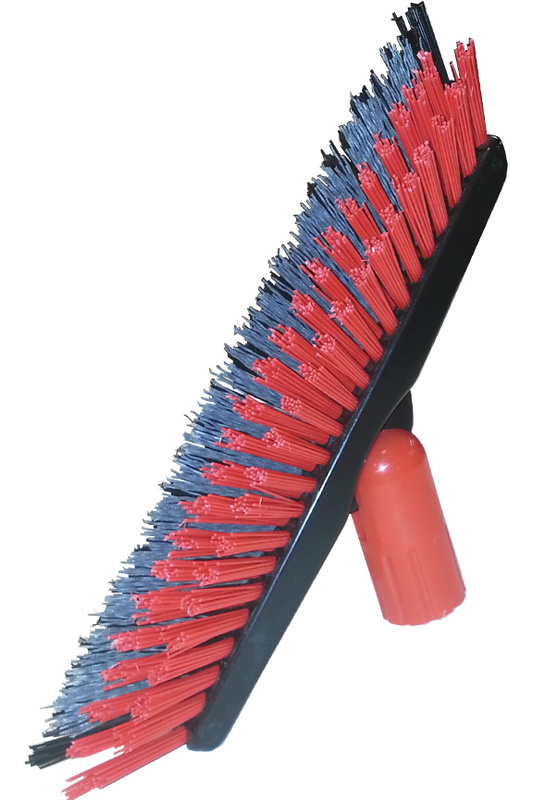 This is an abrasive brush, so make sure to use on a surface that is safe. Find a list below. Softer materials can get damaged, but common bathroom surfaces are completely safe. Prepare the area by wetting with warm or hot water. Add a cleaning solution to the tile, or directly to the brush. A spray bottle can ease the application. Position on tile so that the center row aligns with your grout lines. To scrub, press down lightly and use a back and forth motion, straight down the line. Continue working until the area is clean. The unique shape will remove dirt from the top of the tile and down into the grout in one motion. TO ensure that you clean everywhere without missing a spot, work from left to right, and do one section at a time. For each section, work from bottom to top, or top to bottom. When finished, rinse surface to remove soap and loosened dirt. Lift and remove dirt instead of resorting to toxic liquids that cover it up, or try to burn it away. This professional quality tool will deep clean tile and grout to get every surface and crack completely clean. It's tough enough to withstand the ingredients in any cleaner, but it works so well, they may not be necessary. Try the simple recipe below to make a homemade solution, or check out Scum Off Shower Cleaner for a manufactured mixture of safe ingredients that actually work. Fill sink or bucket with water. Combine ingredients into water. Use equal parts baking soda and lemon juice, and half as much vinegar. The combination will bubble and then stop. Once calm, add to a spray bottle, or use directly on your floor. Eliminate strain and frustration with this quality tool. Other options force you to apply elbow grease to do a good job, but this one cleans amazingly well with very little pressure or scrubbing. Don't put off the job, or settle for inferior products that only cause frustration. The unique row of bristles in the center provide increased abrasiveness, and dig down deep without wearing out. Added silicon carbide speeds up the cleaning process and allows you to do a better job. Use it on any grime on any tiled, bathroom surface. It will easily remove mold, mildew, hard water spots, mineral deposits and other grime. Dimensions 10" x 1.75" x 2.25"
Bristle Height 1" - 2"
End Bristles Pointed outward to clean up to the edge. Pole Optional. Purchase with or without. Use with or without. Pole Size 34" - 60"
Uses For tough clenaing jobs, or longevity in commercial situations. Scrub dirty grout clean in seconds, and also wash tile at the same time. Powerful and long lasting. Make quick work of dirty grout lines without sweating. This mean looking brush will have dirt and mildew running with fear. Order Yours Today! Long Lasting MEAN BRUSH!... This is Ideal for the Homeowner and will save you alot of money! The brush is good for floor tile grouting that is even. For long standing grout issues, it may require doing several times. All in all saves hands and knees effort, which is what I required. I find it helpful and useful but not sure how long the brush bristles will last, if one uses it regularly. Quite happy with the improvement seen after using it. Definitely made the job quicker and easier. Arrived on time too Thank you. Excellent product holding up very well. A lot of thought and quality engineering went into this brush to be able to get this very hard job done. I would defiently will buy another for a back up. LOVE it . Every time I cleaned the bathroom tile grout I wished there was a narrow brush to clean behind the toilet and in narrow places. Finally, I searched online and found the Demon Pro with long handle. This is a scrub brush on steroids. I just saw a narrow, dirty hidden area between the sink vanity and wall which I will now be able to clean with my Demon Pro. This works really well on the grout lines, I am so happy I got the extended pole to go along with this item. No problem with shipment and everything else! items work great, no issue! The grout and tile brush with the pole Saves a lot of time . It is so much easier on your knees and especially your back . I love this product . I'm so glad I come across the good stuff website . I looked at all the Home Depot's and Lowe's and Ace Hardware and could not find this product or anything like it . I was told by sales people several times but I've never heard of anything like what I was looking for. But thank you good stuff I got what I needed . Wow! This saved me a ton of time and didn't kill my back!! Well as ironic as it may seem I just used it yesterday for the first time and it took a little getting used to but after a couple of minutes it worked as advertised and I would recommend this product to anyone as well as your website. I also use this Grout Brush in a professional capacity..I can buy it here Now for less than i pay at Carpet/Tile Supply Cleaning houses.This is Ideal for the Homeowner and will save you alot of money!